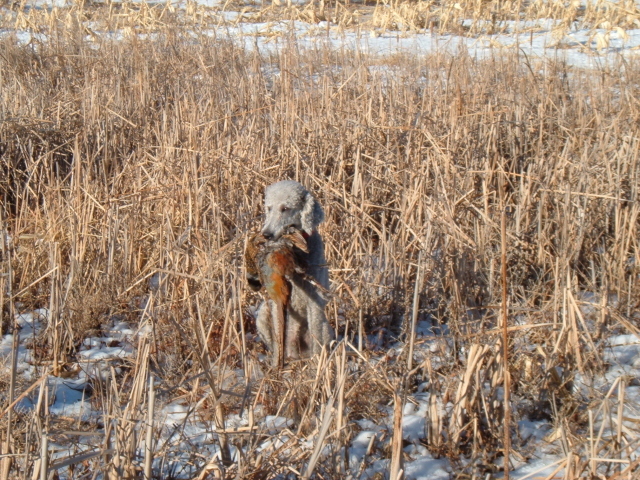 Beau, a silver Standard Poodle whose pedigree and titles make him a standout hunter retriever. 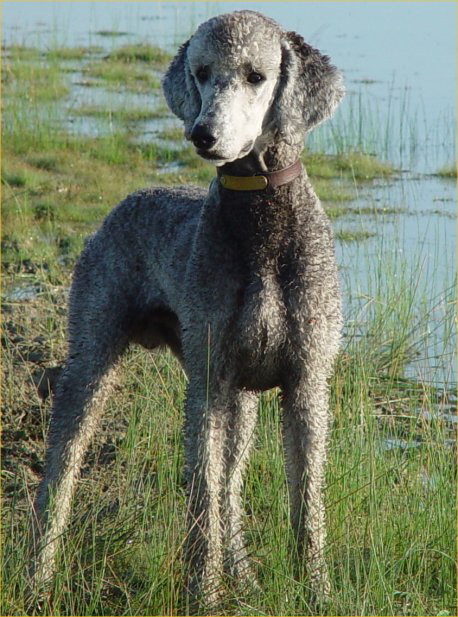 HR Cosmic Lakeland's Le Beau SH, WC, WCX, CGC, call name Beau, is a silver male, born 10/19/2001. He is 24 inches and 60 pounds. He earned his UKC SHR title, his AKC JH and CGC titles before he was a year old. He has a CHIC (Canine Health Information Center) number, 51136. 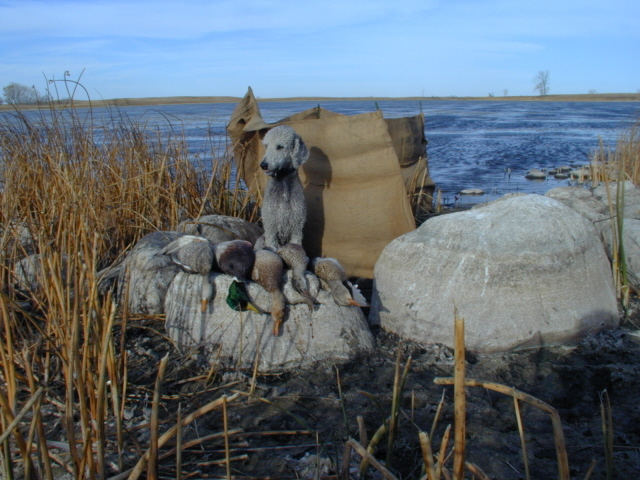 He has his AKC Senior Hunter (SH) title, his UKC Seasoned (Hunting Retriever) (HR) title, went 3 for 3, and one UKC Finished leg toward his Hunting Retriever Championship (HRCH) title. However, I've retired Beau from Hunt testing. 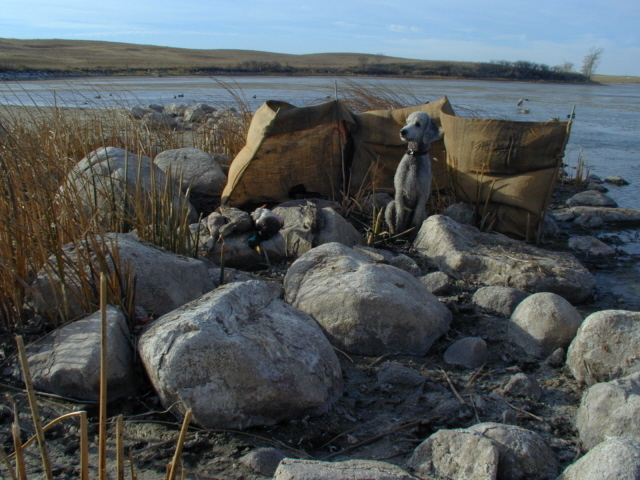 He picked up a bad habit of putting the last bird down during UKC Finished tests on either the last mark of a triple retrieve, or on the diversion bird, or blind and pulling feathers. 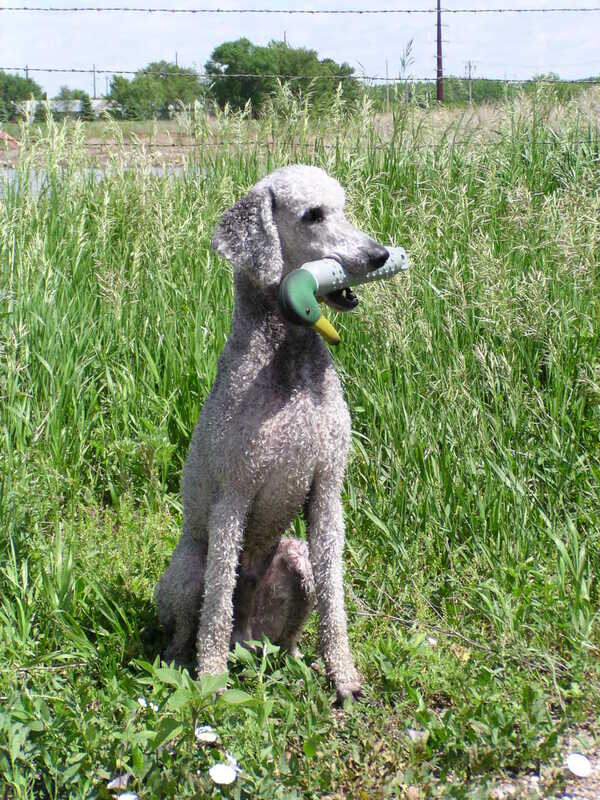 He only does this at hunt tests, never hunting for real or training with or without the e-collar on. Apparently he has learned how to count and hates giving up what he thinks is the last bird. Other trainers tell me it's stress. I say he does it because he knows he can get away with it during tests. 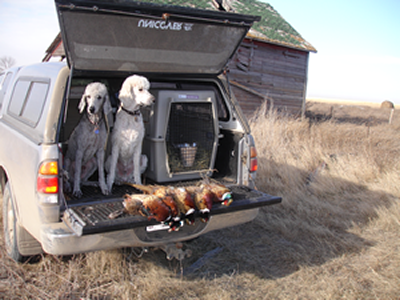 Several professional trainers have told me the only way to break this habit is to simulate a hunt test with lots of other dogs and people around in order to correct it. 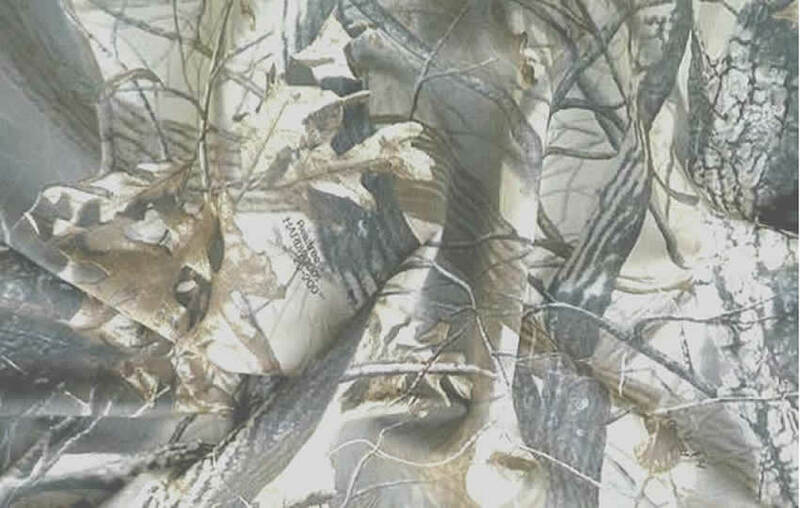 However, I've never been able to fool him into thinking a fake hunt test was the real thing. He's getting up in years but is still full of p--- & vinegar; loves to hunt and shows no sign at age eleven of slowing down. 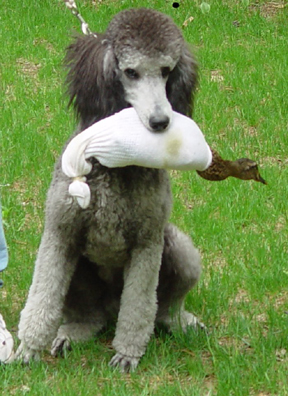 Beau's sire and dam are conformation champions and he looks the part, however, I'm not really interested in that part of the poodle fancy. 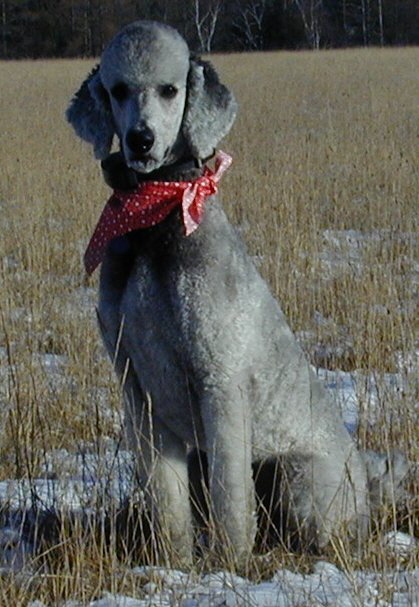 Grace L. Blair MD Cosmic Poodles in Montana, is Beau's breeder.